Bright Yellow items are available in this image and can be ordered by clicking on the tab below. The powerful spirit rises up to fill our lives with all the elements we need to complete the cycle of nature. Raging seas challenge our courage to the limits, teaching us the skills and strength we will need to endure the storms and darkness ahead. A winter wonderland in which the landscape is transformed into a playground for us, and allows nature to slumber, gathering strength to burst forth in all it's splendour, as the first signs of spring approach. 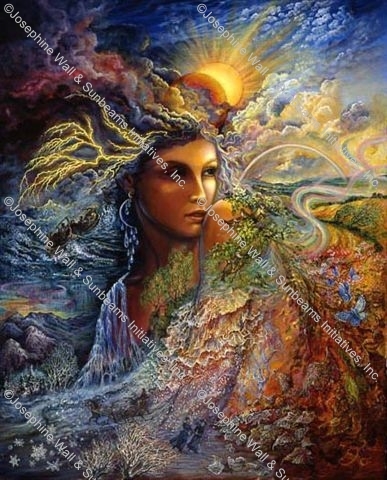 All Images and Content Copyright protected by Josephine Wall & Sunbeams Initiatives, Inc.